One click portrait matts, dynamic image filters, canvas wraps, studio collateral templates for brochures, business cards, zed cards, DVD Jewel cases, everything you need to promote your business. A 189 styles palette for coloring typography, monograms, dingbats, and high school varsity letters that are also included. It also includes 50 museum quality frames. 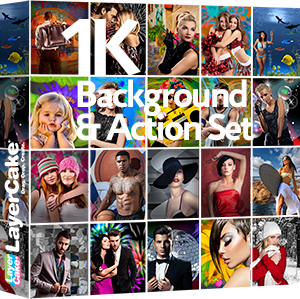 Our customers love the LayerCake Elements’ backgrounds. Additionally, they use Studio GOBOS and the amazing StudioMagic Pro-Panel Compositing Plugins for Photoshop for easy Cutouts; generating realistic shadows with ShadowCaster; then completing their new artwork with Painting with Light! Tags: Adobe Photoshop, art, artists, backgrounds, backgrounds images, Digital, Digital Backdrops, digital backgrounds, Digital Compositing, exotic backgrounds, floral backgrounds, formal portraits, Graphic Design, Graphic Designers, graphics, JPEG, photoshop actions, Photoshop enthusiasts, Photoshop Users, portrait photographers, portraits, sports backgrounds, StudioMagic, traditional backgrounds, Virtual Backgrounds. The collection includes 50, 12" X 24" wedding album backgrounds and 50, 11" X 14" portrait backgrounds. Each can be resized, or cropped, to fit any custom size. Many come with layered elements so you can use your own creativity. This is the perfect collection for wedding and portrait photographers. Add the Album Accents Suite and you'll have a comprehensive album building system, guaranteed to speed up your workflow and make you money!